The New Year begins next week and while I thought I would not be baking any cookies as we gallop into the Horse Year, I just did. I baked my favourite doggies cookies because I crave for them and they are not available in any store. The first time I baked these cookies was in 2012 and if I calculate correctly, today is my third time making them. Last year, I also made these cookies together with my niece too. These prove how much I like these cookies and how good they are because I have baked them more than twice. This afternoon, I quickly made these cookies again when my little one suddenly fell asleep as she watched Despicable Me. Kid's nap time is indeed Mommy's golden opportunity to do all the important things she needs to do during the day. Anyway, these egg-less cookies are so delicious (definitely addictive if I may add), easy to make and surely would make one fun baking project with kids. Ain't these babies so cute? Here's how I made my version of doggies cookies. I slightly adapted the recipe from its original version because I prefer somewhat sweeter cookies. Sieve together flour, corn flour and milk powder. Set aside. Cream butter, icing sugar and vanilla essence using electric mixer at low speed for 3 minutes. Gradually fold the flour mixture into the butter mixture until they form a dough. Divide the dough into around 10gr each. Put 2-3 chocolate chips into each piece of dough and roll it into a small ball. Do this for the entire cookie dough. Place the small balls on baking trays which are already lined with parchment paper. Place two pieces of chocolate rice to form the dog's eyes. Insert a chocolate chip into the cookie dough's centre to form the dog's nose. Lastly, insert two pieces of Koko Krunch on the sides of the cookie dough to form the dog's ears. Repeat these processes for all the cookie 'balls'. Bake the cookies in a preheated oven at 150 degree Celsius for 25-30 minutes. Leave them cool for a while before storing them in airtight containers. Naomi eating Mommy's home-made cookies. Have heaps of fun making these cookies and eating them. Don't worry too much about holiday weight gain. Festive seasons like CNY or Christmas only comes once a year. Finally, wishing you a happy and prosperous Lunar New Year! My Naomi turned exactly 16 months old some four days ago. While I planned to update my blog with her developmental milestones exactly on the day when she turned 16 months, I failed to do so. Why? Because I was busy, lazy and tired. My current project leaves me as a sleepy and exhausted woman on weekdays and on weekend, I just prefer to laze around. Do nothing, literally just do nothing other than taking care of my kid and completing the compulsory housework. 23 January 2014: My silly and happy Naomi. Also, since I was back on WAHM mode a couple weeks ago, I put Naomi on my MIL's house in the afternoon so I can have some 'me-time' to finish my work on-time. I take care of Naomi until lunch time then my husband would drop her to MIL's house after lunch. Naomi'd stay there until dinner time or until my husband gets back from his office, only then I'd get to cuddle my baby and back to 'Mommy' mode again for the rest of the night. Thus far, this arrangement works fine. MIL is willing to take care of two toddlers at the same time (the other one is Naomi's cousin), Naomi is very happy at MIL's house because she has her cousin as her playmate/fighting opponent (when they are in dispute) and I have my quiet time for my work. Anyway, the first few days when Naomi left at my MIL's house, I was blanketed with this massive mother's guilt and my head could not stop thinking about my little girl. I missed her and her smell was like everywhere. I just missed her. And here I am only talking about leaving Naomi at MIL's for 4-5 hours, not even at a total stranger's place. Can't imagine the feeling of those parents who only get to see their kids on weekend. Next, here's some updates on what my little one can do at 16 months old. Naomi runs a lot. Yes, apparently Naomi has been walking for about 6 months by now so she is very capable of running and jumping these days. Naomi watching her cartoon in the morning. Naomi loves cartoons. Her two favourites which can really capture her attention for the whole movie running time in the past few months were and are Despicable Me 1 and Tinker Bell. She doesn't really pay attention and mostly ignore other cartoon DVDs I play for her. Naomi is an utter chatterbox. I can almost say that she is one very chirpiest kid I've met. Naomi is a very talkative toddler but sadly, she can't speak our language just yet. Think of Gru's minions. They are cute, the way they talk is so adorable but none of us hardly understands what they say. Same like Naomi. To date, the only word that Naomi masters well and actually understands its meaning is "Ta-ta!" (or Dada which means bye-bye in Bahasa Indonesia). She'd say "Ta-ta! Ta-ta!" and wave her hand every time she realizes that she's leaving a house, going somewhere or saying goodbye to us. She still can say Papa or Mama but on random basis. Although I am glad to have a very chirpy baby, because it's really cute and ticklish to hear her saying nonsense in her baby language, I hope she won't get into a trouble with her teacher for talking too much during lessons in the class when she goes to school. Okay.. I think too much and too far here. By the way, have I mentioned that Naomi is super talkative that both my husband and I can't keep up with her talking that goes on and on until past midnight and we usually go to sleep first whilst she's still busy talking to us? Indeed, there are nights when we tell her to shut up and just go to bed. She's not tired but we are tired. Speaking of talking, Naomi loves to be constantly on the phone like a real woman CEO running her multi-billion dollar company. She uses real cordless phone, our hand phone, wi-fi dongle, toy, TV remote control, ceiling fan remote control and any other thing that looks like electronic as her 'phone'. I don't know whom she talks to on the phone but from her expression, body language, length of conversation and volume of her voice when she is on the phone, all her phone calls seem to be pretty very important. Sometimes she sounds like she is reprimanding someone or angry at her 'imaginary' staff... Or maybe her stock price goes down or something. Go watch Naomi's video when she's on the phone in my Instagram. New favourite game: Riding Papa's back. On another note, I am quite proud of Naomi's social skills, especially with her peers. She is shy when meeting new (adult) people but overall, she is quite friendly and loves to join the kiddie crowd like she has known those kids since Ice Age. Naomi's sleeping schedule until now is still very sporadic. In general, she still sleeps past midnight and sometimes wakes up early in the morning or late in the morning or noon. So unpredictable. Can't imagine how I'd get her to wake up early for school when the time comes. Naomi loves feeding herself with spoon or her tiny fingers and refuses us feeding her. Of course, the mess she creates during every meal time is always phenomenal. Rice on the floor, rice on her pants, rice on her cheek, rice on her hair, rice is everywhere. 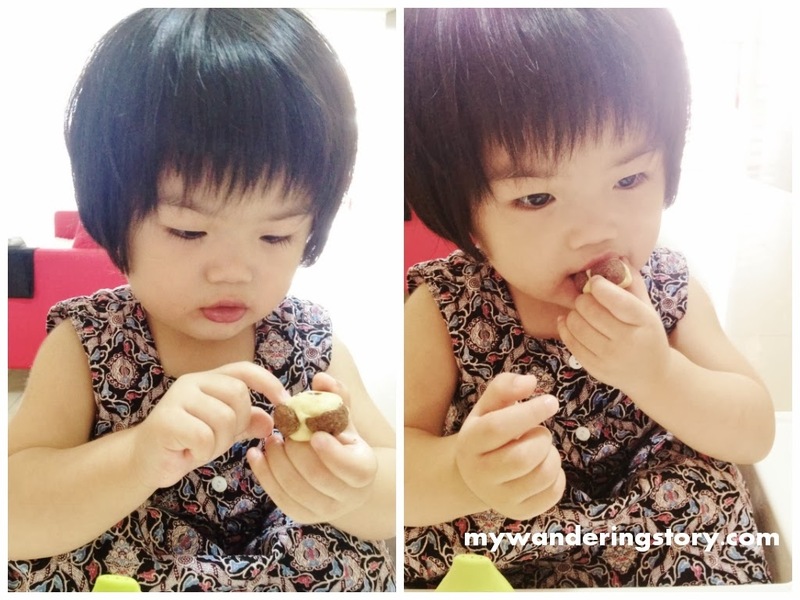 Naomi eats food that we normally eat like rice, bread, noodles, pasta, vegetables, etc. Often times, she refuses eating the food that we specially prepare for her and grabs all the food that we, adults, have on our plate when we sit together for dinner or lunch. She just wants to eat the exact same food that we eat. Beginning last weekend, Naomi developed a new laughing pattern. She laughs "HAHAHAHA!" with her mouth opened wide and using a tone that I can't exactly mimic but it pretty much sounds like how an old fat uncle with loud voice would laugh. She laughs hard and loud when she's happy, not necessarily when there is something funny happening. As I often complain how naughty and too active Naomi is, apparently I smile and laugh more because of her being naughty. Sometimes her naughty or silly deeds are just too funny to handle. Motherhood is indeed so complicated, in a good way. Today is one of Naomi's important days because her parents spontaneously took her to enjoy her first plunge in a real swimming pool! Well, Naomi had played water in her inflatable swimming pool months ago at home but I guess that did not count as 'swimming' experience per se. Getting ready for her first swim. My husband and I got really excited to bring our little girl to swim for the first time and Naomi wore her brand new Speedo swimming suit that we recently bought in Indonesia. Showing off her cute little back! The weather this evening was somewhat perfect for little kids to swim. The water in the swimming pool was rather warm, which was good. Sadly, we picked the busy time of the week for Naomi's first swimming experience as the kid swimming pool was kinda crammed with children around Naomi's age and those older and bigger than her. Anyway, after the three of us changed into our swimming suits, we quickly took a dip in the kid's swimming pool. My husband put the armbands on Naomi's arms and made her sit in her baby swim seat. All good to swim now! In the beginning, my husband was the one who introduced Naomi to the water and the crowded swimming pool environment around her. Naomi didn't look so scared but she was indeed really alert and curious. She looked around the pool and watched every kid splashing water and swimming passing by. Happy baby in the pool! Minutes later, Naomi began slowly walking around the pool inside her baby float. She walked towards her Dad and me. Again and again. She was really having fun playing with the water. As I watched her playing water with her Dad, I accidentally witnessed a little girl stood next to Naomi vigorously blew her nose. Then, I saw the things that I really didn't want and wish to see. That girl's yellow mucus came out and dangled below her nose. She wiped it. Not long, she did it again! She blew her nose for the second time and another mighty yellow mucus came out again. This time around, her mother noticed, quickly wiped her mucus and washed her dirty hands in the pool. Good Lord, my heart sank as deep as Titanic's wreck in the north Atlantic Ocean when I saw this. I really wished Dettol had come out with some baby bath soap range to combat germiest situation like this. Horrified, I mumbled to my husband and myself, "Welcome to the public swimming pool." Naomi checking out her surroundings. Naomi didn't say a word for the first 15 minutes in the pool but she kept on smiling when she was in the pool. Since I guess Naomi was now brave enough to play in the pool, I told my husband that he can have some swim in the adult swimming pool and I will take care of Naomi in the pool. After my husband went to the other pool, I followed Naomi wherever she walked in the pool. I watched her real closely and kept her away from the water slide and bigger kids splashing water. Whilst I was trying to protect her from a kid sliding in the pool, some water splashed by that kid went into my left ear. I was and am really grumpy about it! As Naomi began babbling happily, I got a bit tired from babysitting Naomi in the pool. At the same time, I thought that it was the time for Naomi to call swimming a day because I think 30 minutes of swimming is enough for her. When I wanted to take her out of the pool, I was trying hard to locate my husband in the other swimming pool. I just could not spot him. So many men wearing grey swimming caps and dark goggles! When I finally saw him and tried to make eye contact with him, he just didn't see me and continued swimming some more laps! Gah. Fortunately, by the time I made up my mind to get Naomi out of the water all by myself, he came! After my husband got Naomi out of the pool, he gave her some shower. When Naomi finished shower and already wore her clothes, my husband went to take some shower too. Who knew that as soon as my husband left to the shower room, Naomi became so defiant and uncontrollable when she saw the kid pool. She fervently wanted to run and get inside the pool again. I tried really hard to stop her and she threw her very best summer storm on me. She screamed, kicked, cried, hit me in the face when I took her away from the pool. This full blown screaming fit happened not only once but several times until many people looked at us and I was that close to lose my cool. Joy of swimming had clearly backfired me. I got so desperate and thought of bringing Naomi to ladies' shower room with me so I can change my wet clothes. Thank God, when I was just about to enter the ladies', my husband saved me again. He came out and took Naomi to the car. Lesson learnt - next time, one of us needs to take shower and change into a dry clothes first before giving Naomi some shower after swimming. We need to work on our systematic plans to better handle a toddler after swimming. That's all for our eventful Sunday. This first full week of January 2014 has been a really hectic week for me as I was officially back on WAHM mode as of last Monday. 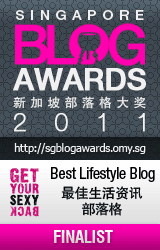 That's why; my blog's kinda abandoned during weekdays. Here is a late blog post on my fruit picking experience at Kusuma Agrowisata, Batu during my last trip to home town. This was not my first time checking out this place because three years ago I went there with some family from Malaysia for seasonal fruit picking as well. The difference was that back then we plucked oranges because it was not the season to harvest apples; and this time around, we plucked apples and red dragon fruits. Also, as I read my old blog post about my visit to this place back in 2010, I just realised that the entrance ticket for one person has set to double in three years' time. Inflation, inflation! We spent like Rp. 35.000 for the entrance ticket/pax three years ago and recently we forked out Rp. 60.000 or Rp. 70.000 for each entrance ticket depending on the must-have food we choose that comes together with the experience of fruit picking in the orchards. Last month, the choices of fruits that each visitor could pluck were 2 apples and 2 pink guavas, 2 apples and 2 pink guavas or 2 apples and 1 red dragon fruit. We went for the latter choice. My sister and brother-in-law took my husband and I to Batu for a short sightseeing on the last day of December 2013. We didn't bring Naomi along because she was not feeling well and my parents assured us that we should go with our plan to Batu and they would be happy to babysit Naomi that day. Actually, we were glad that we didn't bring Naomi along to this place because we left her stroller in Malaysia and it would be rather an intense muscle workout session for us to carry her up and down the orchards at Kusuma Agrowisata. Back to the main topic again - after we bought our entrance tickets, we arrived to the many orchards available at Kusuma Agrowisata. At first, we intended to pluck some green apples but sadly, we had to queue for a long time as they only allowed certain numbers of visitors plucking apples in their orchard at a certain time. Thus, we decided to walk around and find the red dragon fruit orchard instead. Hello from Red Dragon Fruit orchard! I have personally seen dragon fruit orchards in Malaysia from afar many times but never saw them up close let alone plucked any dragon fruit straight from the tree yet. The moment we entered the dragon fruit orchard, one of the staff working at this orchard asked us to walk around and find the biggest dragon fruit that already turn red or reddish we could spot. Once we found the dragon fruit that we'd like to bring home, we ought to call him again for cutting the fruit off the tree for us as visitors are not really allowed to pluck the fruit on their own. We were sort of disappointed when we heard that because we thought we could pluck the dragon fruits with our own hands. Ripe red dragon fruits lurking around. Anyway, the staff also advised us to be careful when checking out this thorny orchard. A thorn from one of these dragon fruit trees accidentally poked my sister's arm but the staff told her not to worry about it. He said the torn that went inside my sister's arm would come out by itself in 2-3 days' time. And erm.. speaking of this, I totally forgot asking my sister on whether the thorn did really come out from her arm days after we went to this place. The four of us showing off our dragon fruits. Once were done with plucking dragon fruits, we continued our journey back to the apples orchard. It was a a pretty long walk for me. I literally huffed and puffed the hilly roadways to reach the apples orchard up there from the dragon fruit orchard down there. I should have hopped on the buggy ride that was offered to visitors for free. Fortunately, by the time the 4 sweaty visitors (re: us) arrived to the apples orchard again, we only queued for few minutes before we finally entered to the apples orchard. Told you, they were tiny! I can only say that big holiday season like New Year that brought huge crowd to this place left us with nothing but small and not-so-good-looking apples in the orchard to pluck. Those apples that within our range to pluck were really not nice at all. My husband and brother-in-law ended climbing the apple tree to get the somewhat bigger apples high up in the trees. So yeah, the guys got to pluck the apples and the ladies were the ones who catch the apples. No chance for my sister and I to pluck the apples from the trees unless we wanted to bring some tiny with brown spots apples home. The boys surely went extra mile to pluck the apples. Shamelessly showing off the apples that my husband passed to me. To conclude this trip, we claimed the food at their Apple Cafe (Kedai Apel) that was included in the tickets fee before we headed home. I had Apple Fried Rice (yes.. green apple bites in my fried rice!) and my other companions had toasts with apple jam with Apple Juice. All in all, it was a good experience and I had so much fun and laughter during this visit. Will I go to this place for the third time in the near future? You know... probably, I will. Hello and belated Happy New Year 2014 to all of you! I just came back from my home town in Indonesia yesterday afternoon and intentionally didn't want to be in touch with my laptop during my holiday, hence the long silence in my blog in the past two weeks or so. I did a little bit of sightseeing around my home town during my Christmas and New Year holiday. Also, I had several short dates around the town with my husband as I had many trusted nannies for Naomi, including my parents, at my parents' home. Moreover, I enjoyed very satisfying culinary tour as we often ate out during this period. Please follow my food trail in my Instagram account. It's just so much easier to do real time updates of all the food I ate or bought in Instagram instead of my blog. During this visit, unfortunately I didn't have any meet ups with my good friends like what I did in my recent visit to my home town two months ago because either I already had plans or they were out of town for holiday. Christmas and New Year are two big holiday seasons in Indonesia because schools usually are on long holiday too during these periods. Moving on, here's a little journal of what I did in my home town in the past two weeks. 23 December 2013: Arrived to Surabaya. Naomi still remembered my parents very well although she had not seen them for about two months. We met my brother who just started his job in Surabaya then had lunch together with him, my parents and sister. Not long after sending my siblings to my sister's house, the five of us continued our journey to my parents' house in Malang. 25 December 2013: It's Christmas Day and on Christmas morning, we went for a Christmas service with my Mom. Psst.. It was actually my first time bringing Naomi to church. She was mostly bored during the service, thus, my husband had to bring her out of the room so she wouldn't disturb the church goers. Below are some of the pictures taken after the Christmas service. Naomi and Grandma after Christmas service. On the night of Christmas, my parents asked us to join a birthday event as they were performing Angklung with their friends there. It was quite a boring event for us and the venue was really hot and crammed. With so many people invited at the event, I bumped into two school friends. One of them I had not seen since primary school. 27 December 2013: My parents, husband, Naomi and I went to Dampit, my Mom's hometown, to visit my relatives and Grandma. It's Naomi third time meeting her Great Grandma and her first time meeting Aunt Cicilia. Naomi went gaga with the broom she found at Aunt Cicilia's shop. The whole time I saw my Grandma when we visited her, I didn't take any picture with or of her. The only picture of her I took was when we were ready to go home and she already locked her house's front gate. Nevertheless, my Grandma gave me her perfect smile when I snapped her picture. 29 December 2013: I was relaxing at my parents' home and took a look an old album of mine which my husband found. Needless to say, I had a joy in digging my old pictures and felt very much nostalgic as I flipped each page. Every picture I saw in this album reminded me of the lyrics of this nursery rhyme "Row, row your boat. Gently down the stream. Merrily, merrily, merrily, merrily. Life is just a dream." Two year old me. Pictures were taken by my late uncle. My grandparents and I on my 2nd birthday party. Do I look like Naomi here? Happiest time - Final year of high school. Looking at all the pictures when I was still schooling, it's funny to think that I often wanted to grow up fast, get done with relentless school assignments and be a working adult the soonest possible. Now, I realize that school was like forever ago and I do miss those fun and silly moments with my friends at school - the times when we didn't have to sweat about making money and such. 30 December 2013: My husband, Naomi and I attended my BFF's son's belated first birthday party. Few hours before attending this party, my husband and I hunted Michael's birthday gift at one of the malls in town. We hope the birthday boy likes his birthday present from us. Anyway, Lily did a good job in planning the small birthday party. Apparently, I was the only friend she invited at Michael's birthday party - the rest of her guests were her family members and relatives. I enjoyed the food selection very much and totally loved the Shaun the Sheep's birthday cake and decoration for Michael's birthday. 31 December 2013: As Naomi could not sleep well due to her runny nose and phlegmy cough the night before, my Dad and I took her to see a paediatrician not long after I woke up. Later that afternoon, my parents said they'd take care of Naomi and asked me to go ahead with my plan to go to Batu with my sister and brother-in-law for sightseeing. It was a fun day and I will share more details of our visit in Batu in separate blog post. Testing the Dragon of Rumah Sosis, Batu. That night, my sister was pretty sick (thanks, flu!) and we didn't really have particular plan to celebrate the New Year's Eve; my husband, bro-in-law, sister and I decided to kill the time at home by playing monopoly game that she just bought. It's been a while since the last time I played monopoly and the four of us had a blast 'buying and trading' properties for about an hour or so. While we were about to get richer by collecting the rents from each other as we had pretty much bought all the properties in this board game, Naomi got really bored playing in my parents' bedroom and noticed us playing monopoly in the living room. As predicted, Naomi tried hard to join us and I, too, tried hard to stop her come near us and our board game. Measly seconds later, I lost control of everything and eventually Naomi raided our monopoly money. With that, we sadly called our monopoly game a day. Happiest New Year to you and me! 2014 arrived when we were already in our bedroom, ready to sleep. This year, we had one of the quietest New Year celebrations we ever had. 1 January 2014: Happy New Year! We didn't do anything special to welcome the year of 2014. My parents' businesses ran as per normal on New Year day and I helped them working on their shops during the day. Random picture of Naomi I took on the New Year. In the evening, we were invited to my uncle's 60th birthday dinner at one of our favourite restaurants in town. New Year means my uncle's birthday. 3 January 2014: OMG! Only one more day before heading back to Malaysia and my long holiday for this year was going to be officially gone. After I packed some of our stuff, I brought my husband to join my sister and her BFF (whom I know as well) chilling at Taman Indie Restaurant near my house as I had never really gone there in a broad daylight. I went there once for my other BFF's wedding party at night. This restaurant has really nice ambience and I love the serene scenery it offers. After we chatted for about one hour, both my husband and I opted to rush home as the sky suddenly poured like it was angry at someone. Will surely go here again some other time! Later that day, my aunt who just got back from Jakarta came to our house and not long after that my Grandma from Dampit arrived to our house. Grandma had accident at her home a couple days earlier (which she didn't admit) and she hit her forehead. Scary black bruise covered almost all of her face following the injury on her forehead. My aunt and I took her to see a doctor and doctor advised her to have further scan and medical check up in the hospital on the next day. 4 January 2014: Woke up at 5am as we had to go to Surabaya to catch our flight at 10.30am. My parents sent us to Surabaya and I didn't have the chance to meet my brother again as it was too early to pick him up before heading to the airport. Again, I left Indonesia with a heavy heart. End of holiday. At 2.30pm, the three of us arrived to Kuala Lumpur safely and had to take a cab home as parents-in-law were in Johor Bahru for urgent family matters. 5 January 2014: Back to my routine and devastatingly homesick. Definitely not ready to face Monday again tomorrow.